An exhibit floor scavenger hunt will be part of the 2016 Annual Meeting and Exposition of the Association of the U.S. Army. 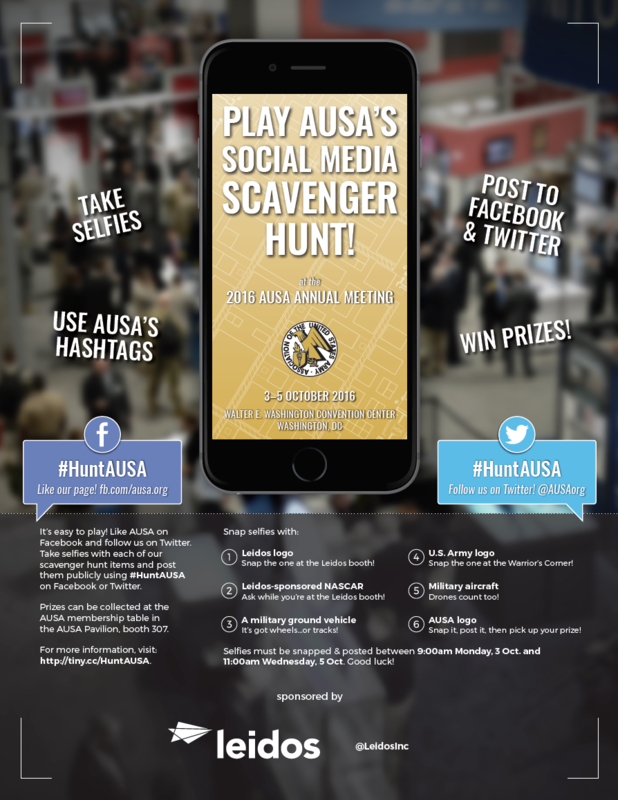 Called Hunt AUSA, the search includes a modest six stops, with a requirement to post photos on Facebook or Twitter of each step. The hashtag to be used is #HuntAUSA. The first 100 people completing the hunt will receive a gift card for coffee, and one finisher – chosen at random – will receive two tickets to the closed event of the meeting, the Marshall Dinner. The annual meeting will be held Oct. 3 to 5 at the Walter E. Washington Convention Center in Washington, D.C. There are six stops on the hunt. The six stops need to be completed between the 9 a.m. Monday, Oct. 3 and 11 a.m. Wednesday, Oct. 5. The exhibition floors are open from 9 a.m. to 5 p.m. on Oct. 3 and 4, and opens at 9 a.m. on Oct. 5. Leidos, a leading defense business, is sponsoring the hunt. Details are available at the Facebook event page.